Rangers have scored their first goal under new manager Steven Gerrard, who you may remember was not so long ago a very fine player for Liverpool. The former England international is now taking his first steps into management, and his Rangers side are in action in the Europa League tonight. 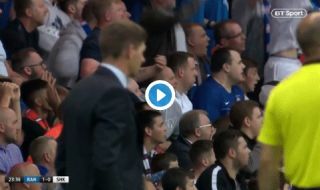 Jamie Murphy has given them a 1-0 lead over Shkupi at Ibrox and Gerrard gave a good old fist pump in celebration. Liverpool fans will no doubt keep an eye on how their former skipper does with Rangers this season as he’d be very warmly welcomed back as manager at Anfield one day after going down in history as one of their greatest ever players.